The Hart of the team? When people think of the Lakers’ young players, they probably think of Lonzo Ball, Kyle Kuzma or Brandon Ingram. Often overlooked is Josh Hart, another essential piece to the foundation who has proven his worth through quiet dominance. 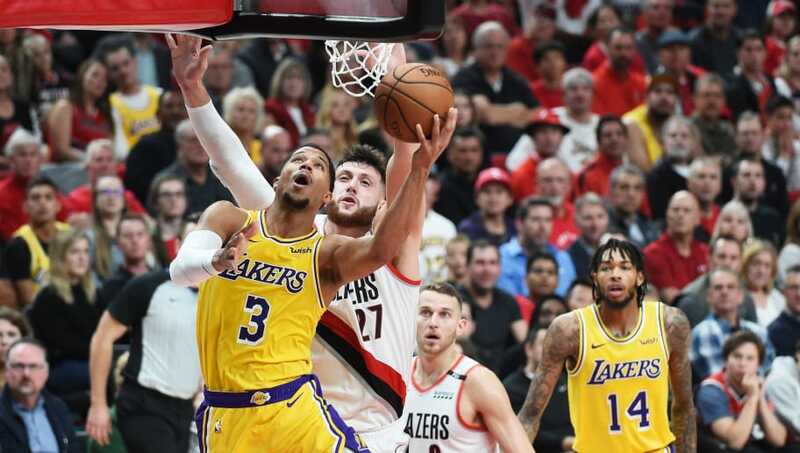 In the ​Lakers’ season opener against Portland last night, ​Hart did a little bit of everything, but it turns out his defense might have been his most important contribution. It’s one game, first game, on the road, no sample, etc. Just in the context of last night’s game, the Lakers had a 128 defensive rating with Hart on the floor and in the 21 minutes he sat, that went down to 86. ​​Los Angeles was a much better defensive team with Hart on the floor, but that wasn’t the only aspect of the guard’s game that was on point. Hart finished as the second-highest scorer on the team behind LeBron James and helped keep the Lakers in the game despite ultimately falling in the final minutes. Hart’s game isn’t flashy by any means, but it’s by no means not productive. Hart slashes the basket well, finishes strong, gets out in transition and shoots the three all very well. That hasn’t gone unnoticed by the Lakers’ coaching staff. Los Angeles already has the best player in the world on its team. But, the young players like Hart will keep on reminding us that James’ supporting cast is not to be forgotten.